Однажды лошадь и ёжик говорили о домах. Лошадь сказал что у него дом. Ёжик не верил. Лошадь сказал что это правда. Но ёжик все еще не верил. Лошадь сказал что он может показать это. И они пошли в город. Там были дома в городе. Где был дом лошади? Это были дома людей. Ёжик просил, где дом лошади. Лошадь показал ему. Однажды волк и лиса были в лесу и говорили о снеге. Волк сказал что снег холодный. Лиса сказала что снег не холодный. Волк хотел показать лисе. Там был снег за лесом. Волк побежал в снег. Но волк был прав. Снег холодный. И сейчас волк был холодный. Лиса смеялась. Однажды волк и лиса говорили о скорости. Они хотели знать кто быстрее. Волк сказал что он быстрее. И лиса сказала что она быстрее. Они соглашались бежать гонку. Но где? Волк сказал что он знает место в лесу. Они соглашались бежать в лесу. И они пошли в лес. Гонка началась. волк бил быстрее. Но в лесу деревья. Волк забыл. И волк бежал в дерево. This is a very summarised table of consonants shifts from Proto-Indo-European to Russian (representing eastern languages) and western languages (represented by Latin and two Germanic languages). Where it is all too apparent I added notes regarding alternative shifsts. The table also completely ignores vowels and other features that affect sound changes and lists only the most easily recognised consonant shifts. I use Latin letters to represent consonants except where not possible when I use old English or cyrillic letters. PIE *<D> sometimes transforms into <L> in Latin (мед <-> mel) at which point the Germanic cognate can have the expected <T> (lingua <-> tongue). PIE *<D> can also transform into Latin <B> if followed by <U> or <W> (duo <-> bis). For the sweet drink "mead" the *<D> apparently survived into Germanic. At this point it should be noted that a Germanic <G> often turned into an English weak consonant creating German-English pairs garden <-> yard, sonnig <-> sunny, Zug <-> tow, gelb <-> yellow. 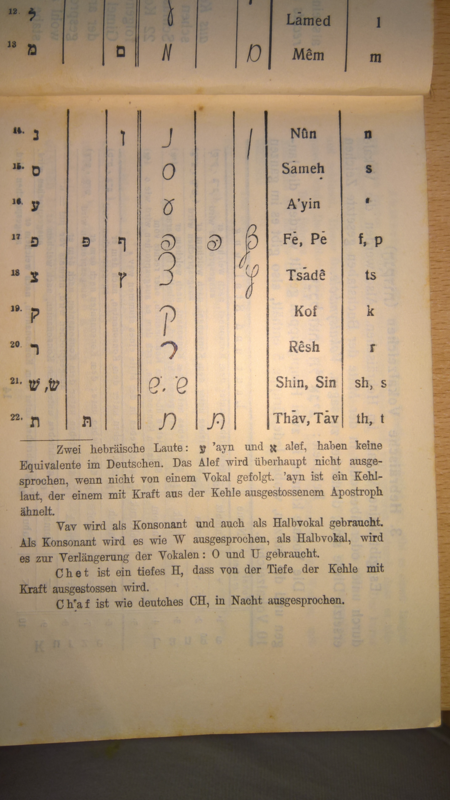 Note that <S> turned into <Ш> (written "sch" in German and "sh" in English) in German (and thus Yiddish) before a consonant. Compare English strone with German Stein where "S" is pronounced like "sh". Before <K> an <S> turned into <Ш> and the <K> is no longer pronounced: school <-> Schule. Latin "libet" apparently exists only in the third person with dative to mean "it is pleasing". For PIE *<W> there are several interesting daughter words. PIE *wodr turned into Russian вада, Latin unda and English water as well as Greek hydra (Greek lost <W>). Likewise PIE *weh turned into Russian вера, into Latin veritas, and into German wahr. All PIE languages except English appear to have lost <W> and replaced it with <V> or <U> depending on pronunciation needs (Greek replaced it with nothing, it just went away). Latin replaced <W> with <V> and <U> only some 2000 years ago. English "very" is a loan from French. The English cognate would have "w". 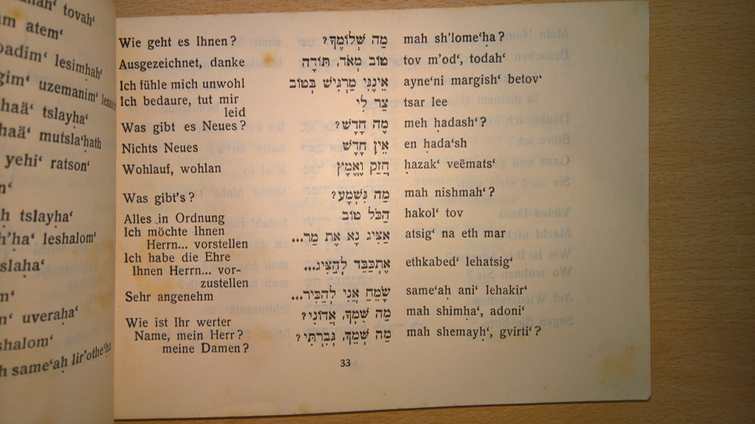 I found this German-Hebrew phrasebook printed in Palestine in 1933. I think the title is interesting. A useful site to confirm words is biblehub.net with its complete Strong's concordance. 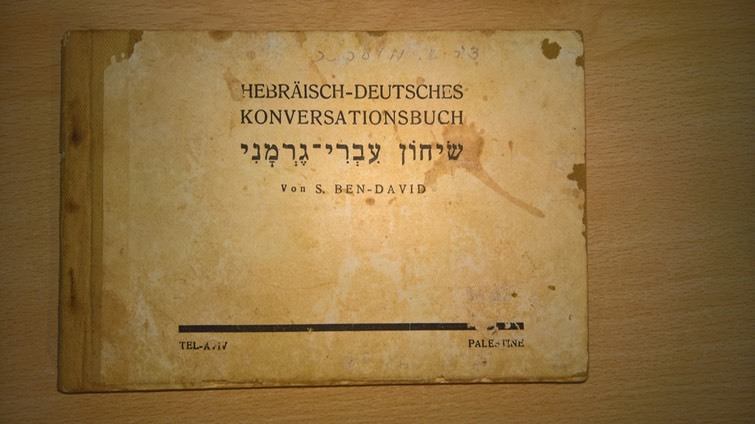 The booklet really does contain page after page of useful phrases which I find most interesting because it shows how things were said almost 100 years ago and only a few decades since Ben Yehuda re-introduced Hebrew as an everyday language. 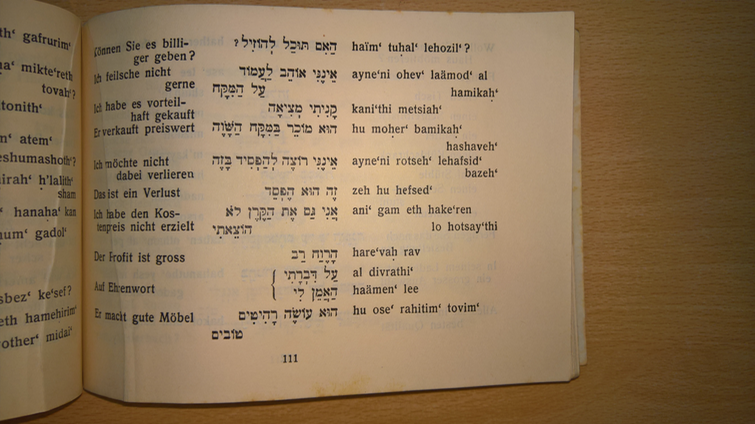 The book has a pronunciation chart. 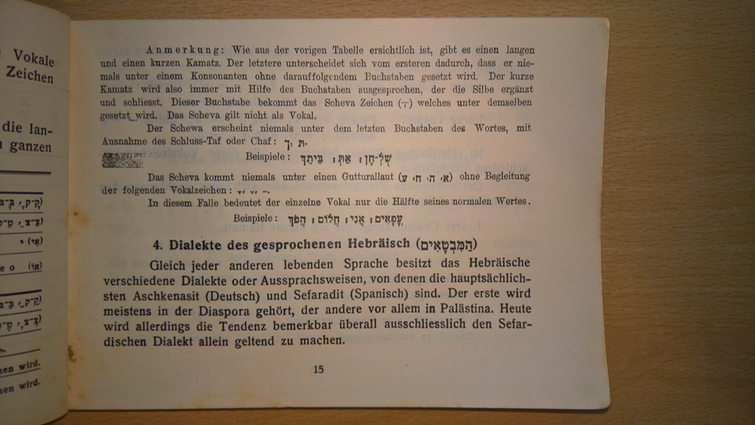 Note that Taw is, at that time and for German-speakers still listed as having two pronunciations like Bet, Kaf and Pe. Alef and Ayin are also explained correctly. As for the content, I have here a few representative pages. One of the typical problems in another country is the names of the food. Personally, I like sandwiches of all kinds, chicken, mashed potatoes, fried eggs and mushrooms. Luckily Israeli cuisine includes an intense focus on sandwiches with chicken, fried eggs and mushrooms as well as mashed potatoes as a side. The Hebrew word for "sandwich" is כָריך "karikh" ("kh" is pronounced like German "ch"), from the verb לכרוך "likhrokh", "to cover". What is covered includes "chicken", in Hebrew "3of" עוף (the 3 is a voiced pharyngeal fricative, imagine something similar to a voiced <h>). That word derives from the verb לעוף "la3uf", "to fly" (without a device). It really means bird but is generally used for chicken. The actual word for chicken (male) is תרנגול "tarnegol" and for chicken (female) תרנגולה "tarnegola". Typical items to add to the chicken sandwich include בצל קלוי "batsal qalui" (the "ts" is an emphatic <s>), "onion roasted", מלָפְפון "melafefon", "cucumber", פטריות "pitrioth", "mushrooms", singular פטרייה "pitriya", "mushroom", גבינה "gvina", "cheese" (this non-kosher combination exists in Israeli cuisine but not in traditional Jewish cuisine). Another typical topping for a sandwich is ביצת עין "bitsath 3ayin", "egg of an eye", "fried egg". It can be called ביצה מטוגנת "bitsa metugeneth", "egg fried", as well. 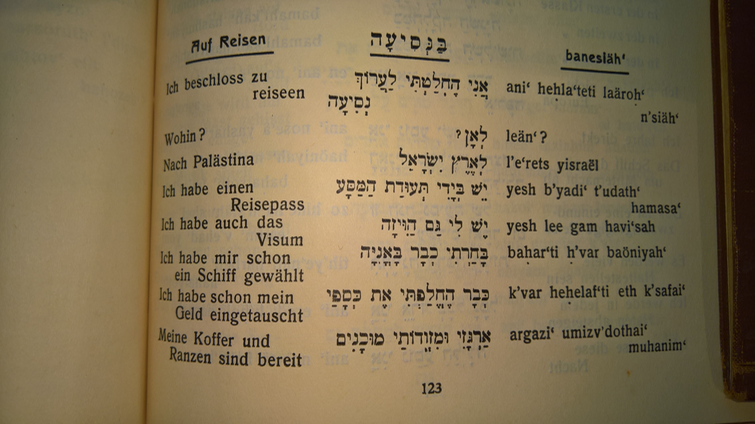 Note that ביצת "bitsath" is "egg of" followed by a genitive while בצה "bitsa" is just "egg" followed by an adjective. לטגן "letagen" means "to fry". Also possible is a חביתה "chabitha", "omelette". Of course Israeli cuisine often ignores the difference between foods based on meat "basar" בשׂר and milk חלב "chalav". A kosher restaurant would not be able to offer both in the same room or made in the same kitchen. 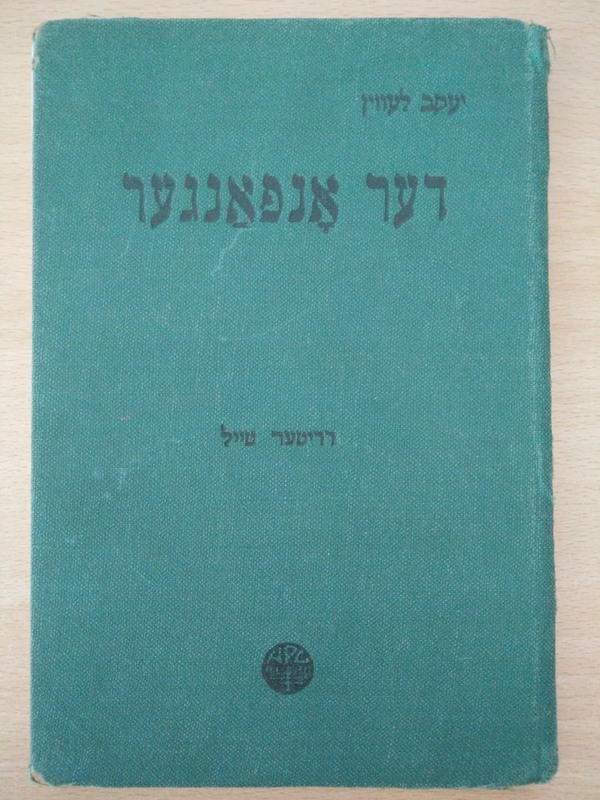 חלבי "chalavi" = "milky" or "milk-based", in Yiddish מילכיק “milkhik". One food that is very typical for the entire levant from Egypt to Syria (and apparently was invented by Christians for lent-based meat fasts) is food based on chickpeas. These include חומוס "hummus" and פלאפל "falaafel" (the א Alef used to mark the long vowel is a sign that this word is of Arabic origin). Hummus is typically eaten with טחינה "tachina", a kind of sesame sauce. For those who want to eat meat, a typical food in the entire region is the kebap (in Turkish, pieces of meat), called שווארמה "shawaarma" in Arabic and Hebrew (again the א Alef marking a long vowel). And then there is garlic: שום "shum" in Hebrew, תום "tum" in Aramaic, and ת׳ום "thum" in Arabic. Add it to anything, all the time. Never mix meat and milk in the same food or kitchen. Other typical toppings for sandwiches are חסה “chasa” = “lettuce", עבגנייה with an Ayin “3avganiya” = “tomato", and sweet potato בטטה "batata", coming to Israel via Arabic traders who travelled without the letter "p". As for the potato per se, it derives its name, like many things do, from the word for apple תפוח "tapuach" (not the one from Genesis, that was a פרי "peri" which is the source of the word "pear" and very likely was one such, as pears are the apple relative native to the region). A potato is a תפוח אדמה "tapuach adama", "apple of earth" or "apple of ground", and an orange is a תפוז "tapuz", originally a תפוח זהב "tapuach zahav", "apple of gold". Eat them with the linguistic ramifications in mind. There is an entire garden of linguistic riddles involved with all the words for fruit and earth. פרי appears related to all sorts of growing things, like פרה "para", "cow", while אדמה, "earth" or "ground" is related to אדם "adam", "man", and דם "dam", "blood", as well as אדום "adom", "red". Think about what this means regarding "be fruitful" פרו "peru" and other parts of the story. It just adds to the general confusion that the word for "mashed potatoes" is פירה "pire" from French "purée" via German and Yiddish. The word is of course unrelated to fruit and cows. If you are sick of drinking milk, you can have מיץ "mits", "juice", יין "yayin", "wine", or מים "mayim", "waters" (which is plural). For those who prefer restaurants over streed food, let it be known that "restaurant" is מסעדה "mis3ada", from לסעוד "lis3od", "to dine". 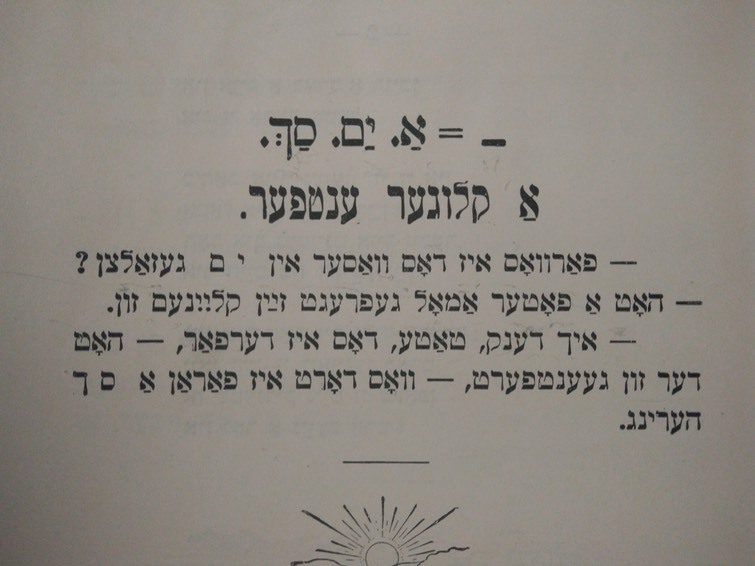 "Food" as such is אוכל "okhel", from לאכול "le'akhol", "to eat". And לשתות "lishtoth" is "to drink". To order (and to invite) is להזמין "lehazmin" and you can pay using כסף "kesef", "silver" or "money", or כרטיס אשראי "kartis ashrai", "credit card". Jewish bean counters have an entire book on what to do and not to do with which types of grains. And they actually did include beans in those regulations. The word for bread is לחם "lechem" and the typical grains are חיטה "chita", "wheat", דורה "dora", "millet", שיפון "shippon", "rye", אורז "orez", "rice", and תירס "tiras", "maize". אפונה "afuna" is a bean or a pea. Certain grains must not be eaten in a leavened state during Passover. Find all relevant regulations and traditions on the Chabad Web site Passover section. Israel is located in the world's wheat zone. All other grains are traditionally imported but some, like rye and millet, have been known for millenia. The word for rice came with the rice. Apart from עוף, the bird, typical animals to be eaten include בקר "baqar", "beef", טלה "tala", "lamb", and the Turkey bird הודו "hodu", which is “India”. It is named, like in England, after a far away land. Note that Turkey is not far away from Israel but India is. Also note that the damn bird actually comes from America. Note that rye is very prominent in European Jewish cuisine but not in Israel. I don't know if rye actually grows in Israel very much. Generally Israeli cuisine is not close to Ashkenazi (German-Jewish, European-Jewish) traditions. The שניצל "shnitzl" made it over as did some other "delicacies" but most Israelis don't eat them (and no sane tourist would want to). Israel, as a country culturally bordering Germany, is capable of producing some great chocolate as well. But that is a tradition that came to Israel from France and Austria and it's not native. Enjoy some pictures of Israeli food in the gallery. One of my hobbies is collecting old newspapers. 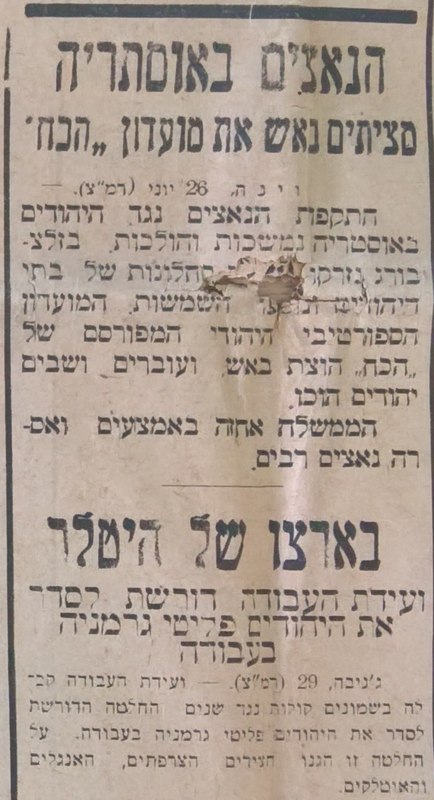 I have here an issue of Do'ar HaYom ("Post of the Day") from Jerusalem from 1933. 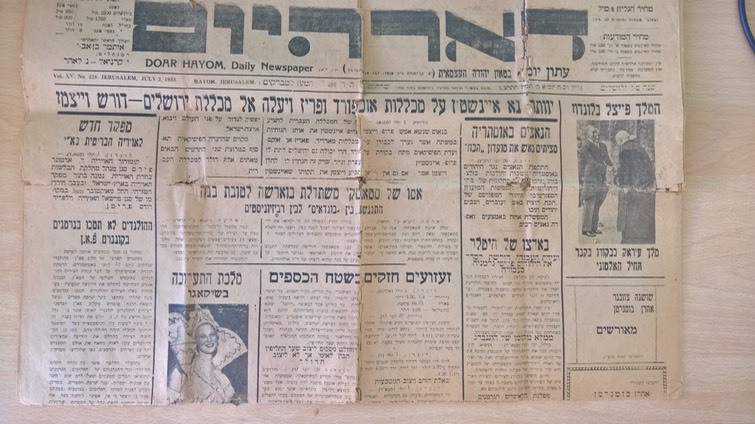 This is the newspaper ran by Itamar Ben-Avi (born Ben-Zion Ben-Yehuda), the son of Eliezer Ben-Yehuda, the linguist who reintroduced the Hebrew language and invented the modern words, including the word עיתונאי (using "3" for an Ayin: 3itonai), "journalist" (based on עיתון, newspaper (3iton), based on עת, time (3et)). This issue here is from July 2nd, 1933.
Notable bits include that picture of a woman. 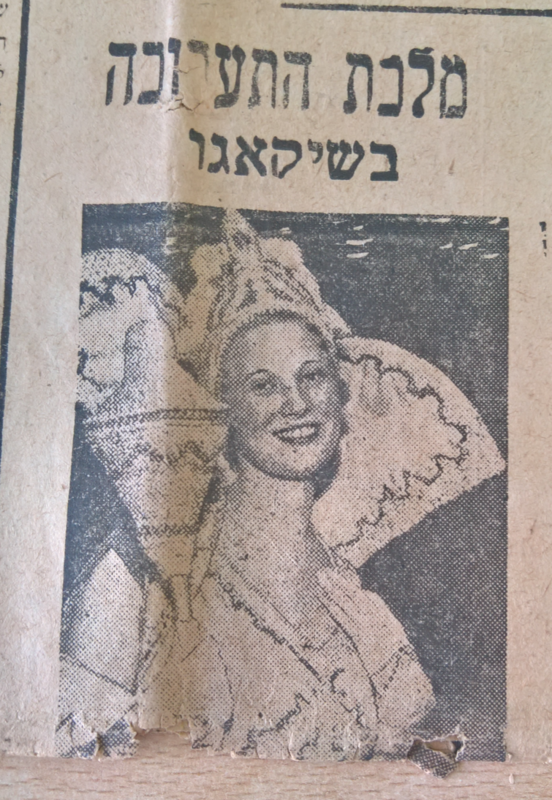 She was, apparently, the "exhibition queen" of Chicago. I think the Chicago exhibition referred to was the "Century of Progress" but I don't know who she was. Then there is a column about Nazis in Austria attacking Jews. Note that this is several years before Austria's annexation into Germany and only a few months after the Nazis' election victory in Germany. 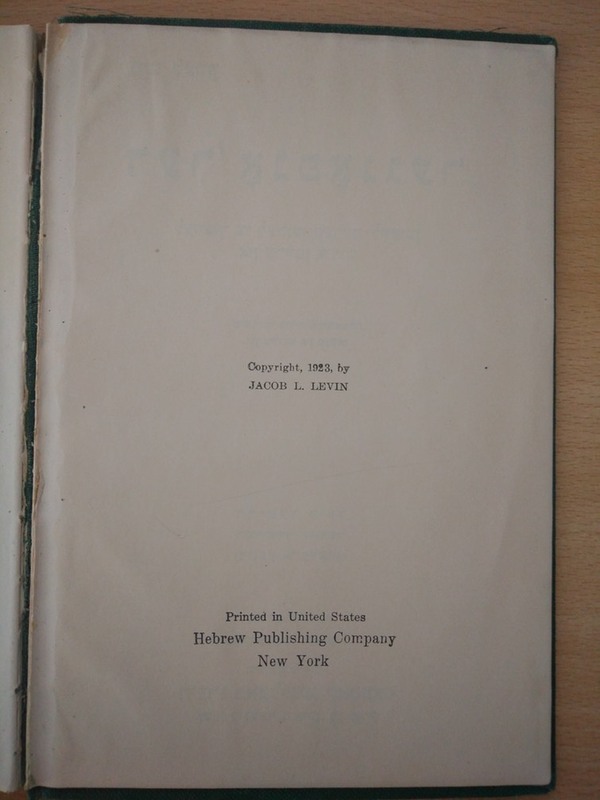 The lower part titled "In the land of Himmler" speaks of Jewish refugees from Germany and a Labour Conference demanding that they be allowed to work. I think this is the event described here on the Jewish Telegraphic Agency Web site. 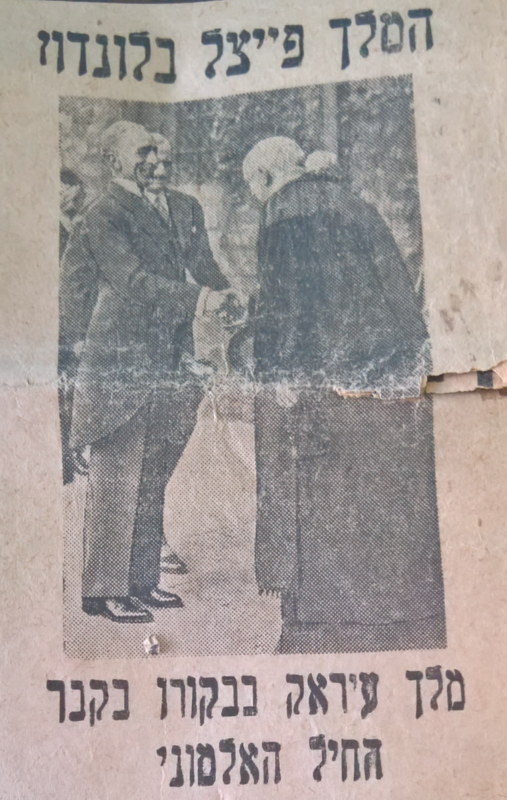 And finally there is mention of Faisal, the king of Iraq, visiting the tomb of the unknown soldier in London. King Faisal of first Syria and later Iraq was an ally of the British during World War I. The tomb of the unknown soldier is a World War I memorial. 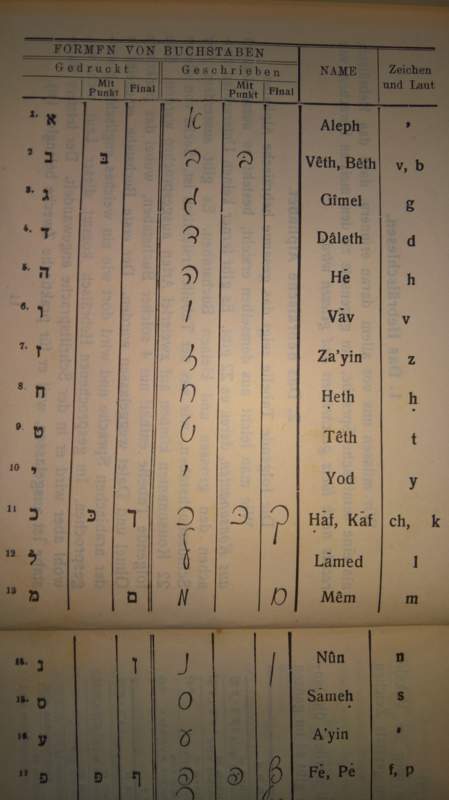 Following the Semitic cognates table we can see that Hebrew צ (emphatic s) can correspond to Aramaic ט (emphatic t) and Arabic ظ (emphatic z) or to Aramaic צ and Arabic ص (emphatic s). The first צ derives from a proto-Semitic emphatic voiceless interdental fricative (that doesnt exist any more in the three daughters peeped at here), the second from, you guessed it, an emphatic s.
The Hebrew words for "coin" and "ring" are, respectively, מטבע ("ma6be3a") טבעת (pronounced "6abba3at" with a doubled Bet). Both words seem to derive from a root טבע (emphatic t, b, Ayin) and I really want them to be loan word from Aramaic טבע which hopefully means "finger" but it might not. And for Arabic ظبع (emphatic z, b, Ayin), Google gives me nothing. Wunderful. I am not getting anywhere. It didn't work. While the words for "finger" and "colour" appear to derive from the same root which has survived in all three languages, the words for "coin" and "ring" don't seem to be related. The obvious solution is to look at what the root טבע (of coin and ring) actually means, in Hebrew. I don't think the translation "nature" has anything to do with this (although it also exists in Arabic as طبيعة (pronounced something like "6abu3a"). So that's it. I cannot connect rings and coins to fingers and colours. But I will always remember the four words as if they belonged together. *I use ś for an emphatic s and 3 for an Ayin. **I also use 6 for an emphatic t.
In 1066 the Normans invaded England. They brought with them the French language. And they changed the English language forever. The Anglo-Saxon dialects of the Germanic languages have been infused with French words but remained otherwise a model Germanic language. Since the French-speaking Normans were the rulers, it is mostly courteous words (and the word "courteous" is a hint where this is going) that were replaced with French words, while familiar words remained Germanic. In many cases both the French and Germanic words survived and even today it is usually improper to use the Germanic word in polite society while the French word should be used instead. One word that was replaced completely was the Anglo-Saxon word for "doubt". The original Anglo-Saxon word for doubt is a direct cognate of the German word for "doubt", "Zweifel". Recall that a Germanic <t> corresponds to an original Indo-European <d> and, ultimately, a German <tz> (spelt "z"). The German word "Zweifel" is cognate with Latin "dubio". The "z" corresponds to the "d", the "w" to the "u" and the "f" corresponds to "b". This mirrors the German word "zwei" and its Latin cognate "duo" (as well as its English cognate "two", which has "t" instead of "z"). A "doubt" is in fact a possibility that there is more than one outcome for something. It is quite literally a "two-ness" of a thing and the word "doubt" ultimately derives from the Indo-European word for "two". I uploaded an archive of the original Not A Linguist Blog here.